Justin Michalski, son of T.J. and Jill Michalski of Medina warmly welcomed Rhonda Wurgler, Executive Director of the Children's Center of Medina County, Scoutmaster Jeff Milam of BSA Troop 5137, funding partner Medina Sunrise Rotary, family and 95 close friends to his Sunday afternoon Eagle Scout Court Honor hosted by the Medina VFW Post 5137. Following the opening ceremony, in which BSA Troop 5137 led us in the Pledge of Allegiance, the Scout Oath and Motto, Justin Michalski, a recent Student-of-the-Month Senior at the Lawrence School, explained in detail his 10-years of Scouting on the journey towards Eagle and the year-long process of planning, proposing, and constructing an 8 ft., 300 lb. durable outdoor picnic table for permanent use by the Children's Center as part of his BSA Eagle Project. He gave a special thank you to his parents, grandparents and family for their support, his scoutmaster and fellow scouts in BSA Troop 5137 for their hard work on the project, Medina Sunrise Rotary for their funding and encouragement, the Children's Center for their community partnership, and all the guests who came out to celebrate and share Scouting's highest achievement with him today. Rhonda thanked Justin, saying that his picnic table and benches are a resource which affords more opportunity and hope for families to reconnect, share time in a safe space, and grow stronger together at the Children's Center. 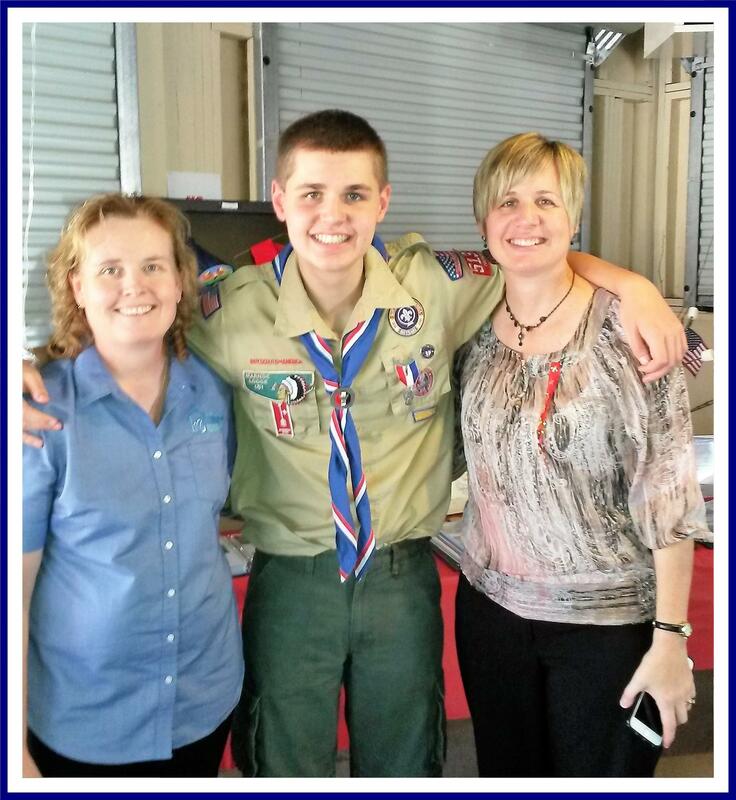 She thanked everyone for attending Justin's Eagle Court of Honor, reminded everyone of Justin's remarkable achievement and that he will embark on a new journey today, and then congratulated BSA Troop 5137 on their 4th Anniversary, "as a troop which puts the COOL back in Scouting!" 1. 181 NASA astronauts were involved in Scouting (57.4% of astronauts). 39 are Eagle Scouts. 2. 36.4 percent of the United States Military Academy (West Point) cadets were involved in Scouting as youth. 16.3 percent of cadets are Eagle Scouts. 3. 22.5 percent of United States Air Force Academy cadets were involved in Scouting as youth. 11.9 percent of cadets are Eagle Scouts. 4. 25 percent of United States Naval Academy (Annapolis) midshipmen were involved in Scouting as youth. 11 percent of midshipmen are Eagle Scouts. 5. 189 members of the 113th Congress participated in Scouting as a youth and/or adult leader. 27 are Eagle Scouts. 6. 18 current U.S. governors participated in Scouting as a youth and/or adult volunteer. Four are Eagle Scouts.